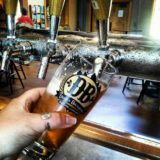 The Devils Backbone Outpost Tap Room & Kitchen is located on a beautiful hillside in Lexington and houses the custom-built brewery, bottling and canning lines, taproom with fast-casual dining, and outdoor beer garden. Along U.S Route 11 just north of Lexington. Tap Room Hours: Wed-Sat 11:30 am-10pm, Sun-Tues 11:30am-9pm. Brewery Tours: Sat-Sun 2pm, 3pm, 4pm & 5pm.